Giving the importance of social Media, the Arunachal Pradesh Police launched it’s Public grievances pages in Facebook, Twitter and in own Website. 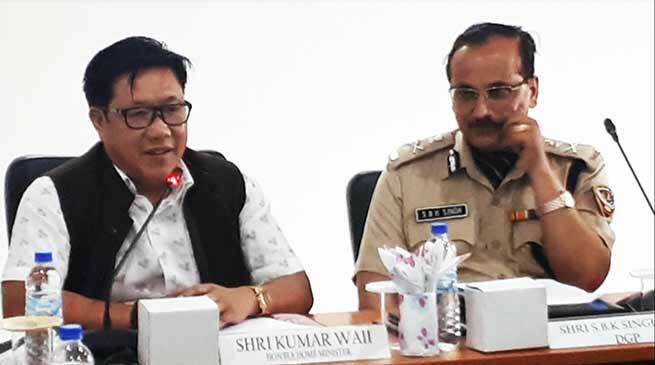 Launching the all three pages at Police Headquarter (PHQ) here Home and RWD Minister Kumar Waii, appreciated the police department for creative idea to connect the common public through this module. He advice the police personnel to gain confidence of Common public by giving proper service and said that police job is very respectful and responsible job but now common publics are not respecting the police personnel due some misdeeds of few police personnel with public. Arunachal police department is receiving highest RTI Complain than the Uttar Pradesh home department which is very bad sign for the State home department he added. The Arunachal Pradesh is a vast State and there are several areas which are inaccessible and extremely difficult to reach. But these digital initiatives in order to give an opportunity to people of Arunachal Pradesh to come closer to Police, said DGP SBK Singh. The members of the public will be able to lodge their grievances after verification of his/her email address. It is also a forum where public can give suggestions for maintenance of law and order and improvement of public safety and services for humanity. The Grievances Redressal Module will be visited by an officer in District SP office on daily basis and it will be ensured that the grievances are redressed as per law expeditiously. Replies will also be filed on the website. The functioning of the module will be monitored at PHQ under SP (Crime) and he hop that this initiatives are expected to work as force multiply in times to come. The technology will help to bridge the between the police and public gap. DGP also inform that another landmark step which we are planning is related to welfare of policemen and their families. We are requesting wives of senior officers to take the lead and organise welfare centre’s at every district headquarters where women can be engaged gainfully and eventually become financially independent. And Also, regular health check up camps, establishment of skill centres and making provisions for giving financial help to needy and talented children of police personnel in the fields of Education and Sports are being planned, he added. He also said that Yoga is being introduced in police department from next month and slowly it would be mandatory to have exercise and sports for all police person. He inform the house that SP (Crime) shall be doing the job of Public Relation who will interact with media from time to time as and when necessary in addition to her normal duty.